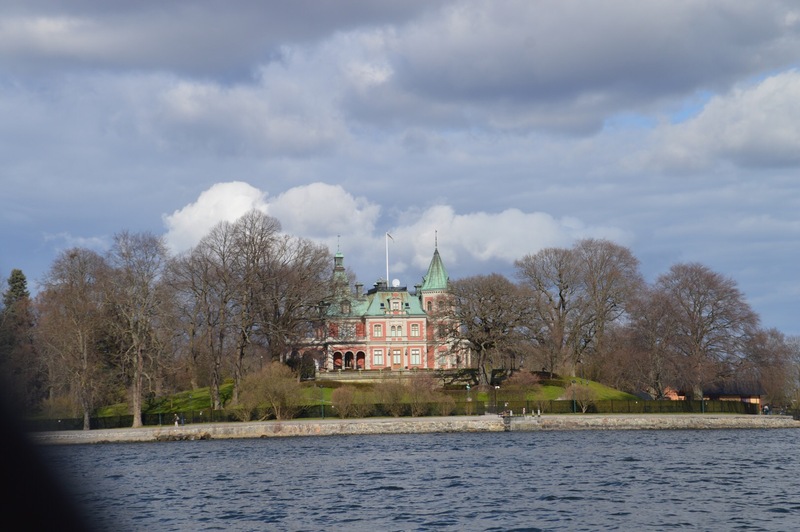 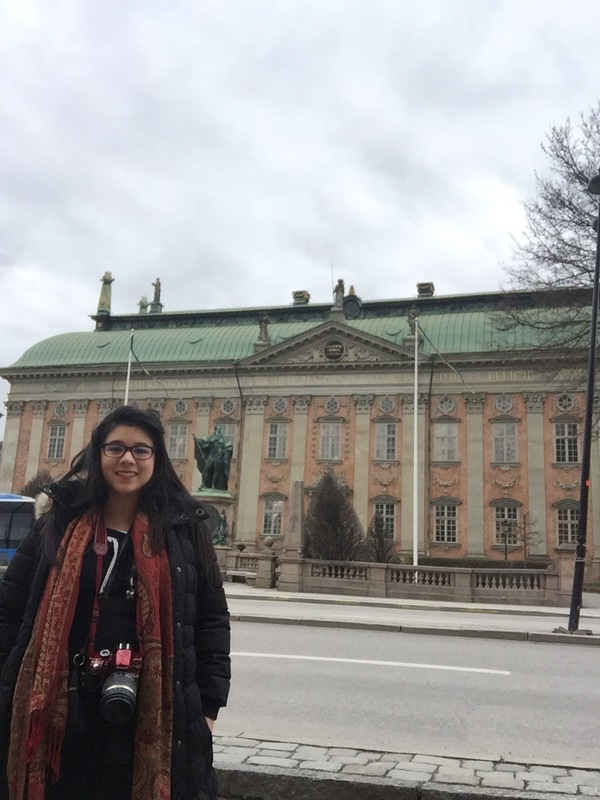 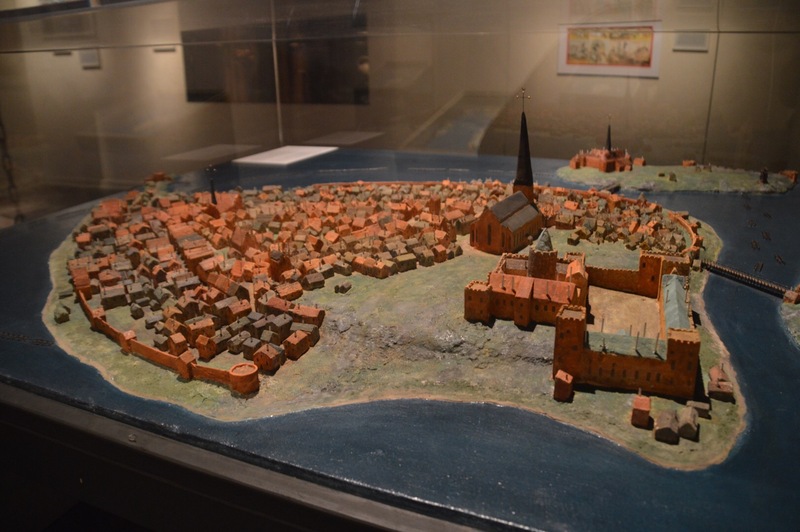 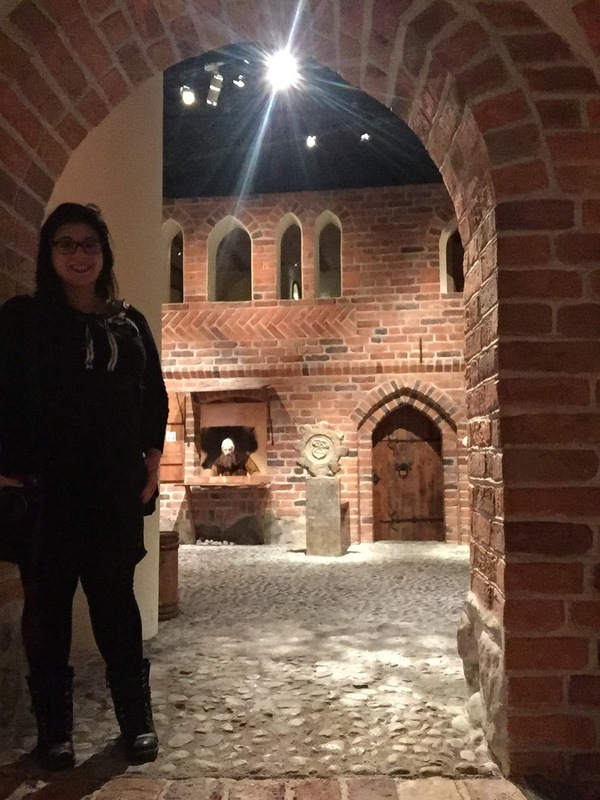 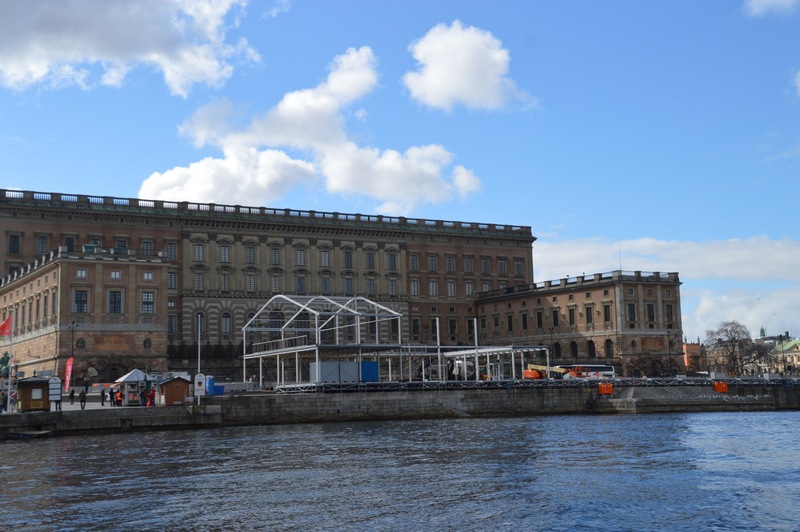 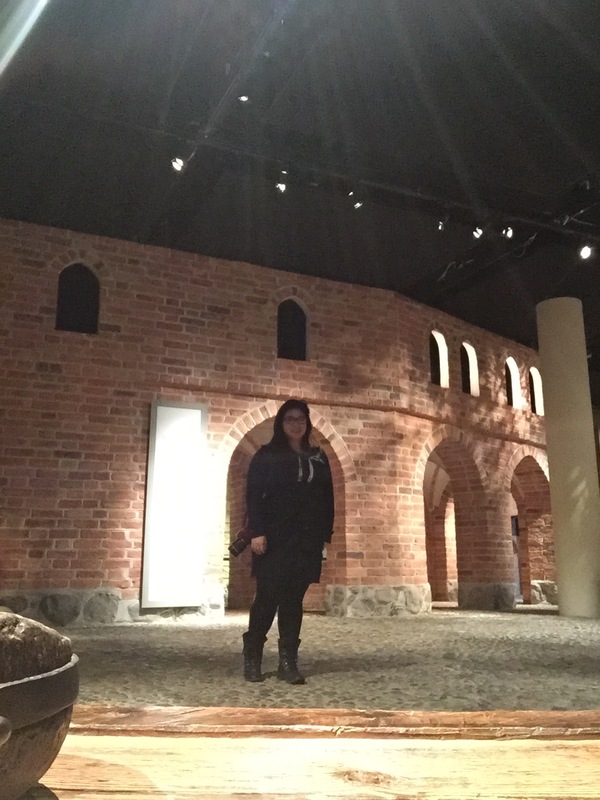 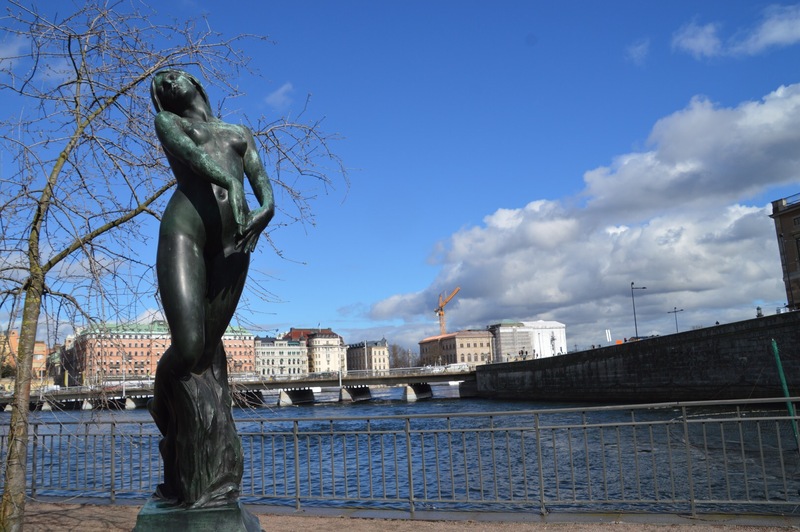 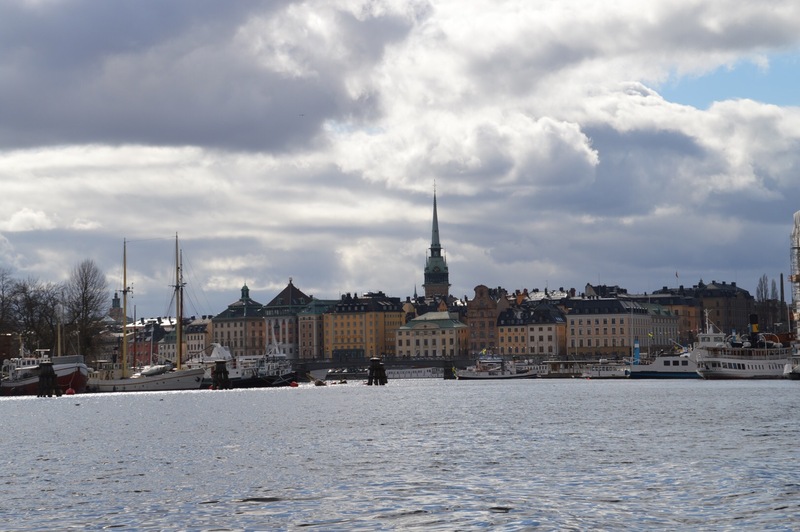 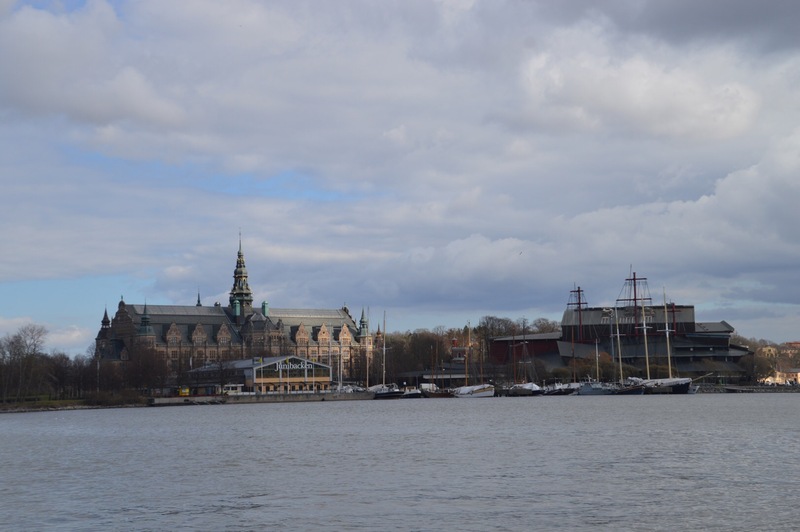 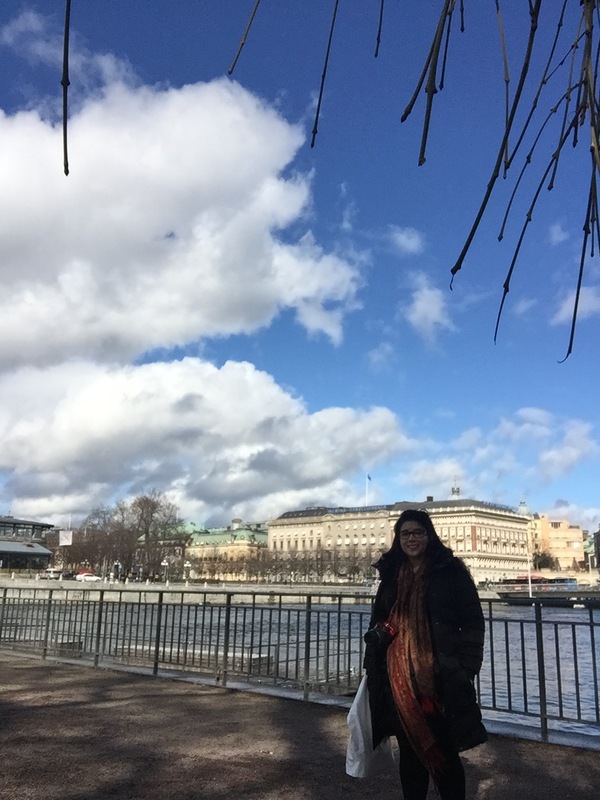 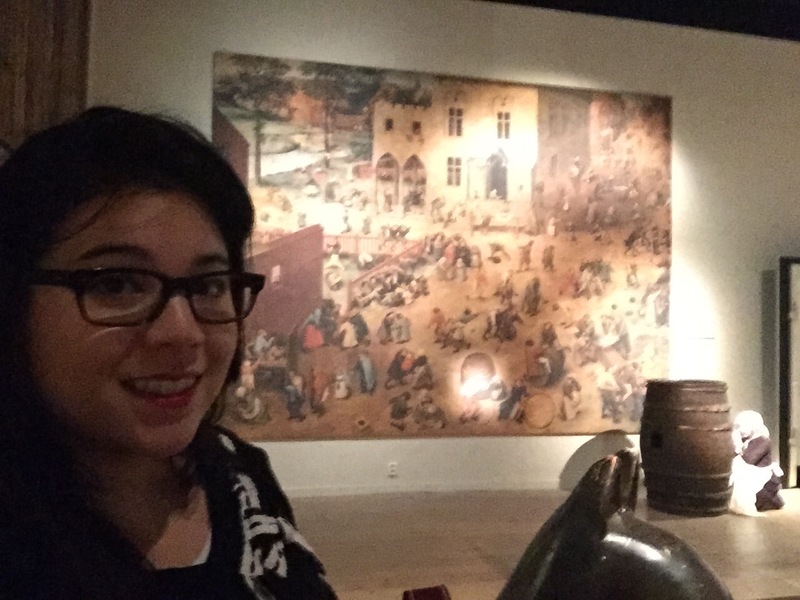 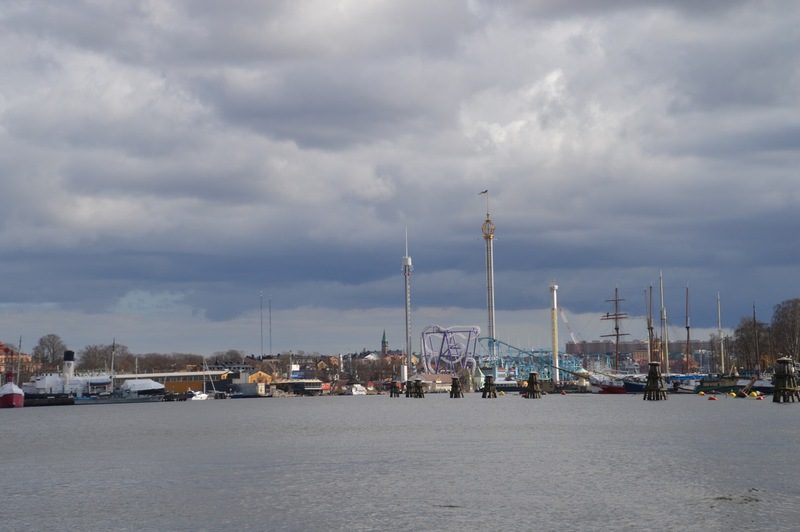 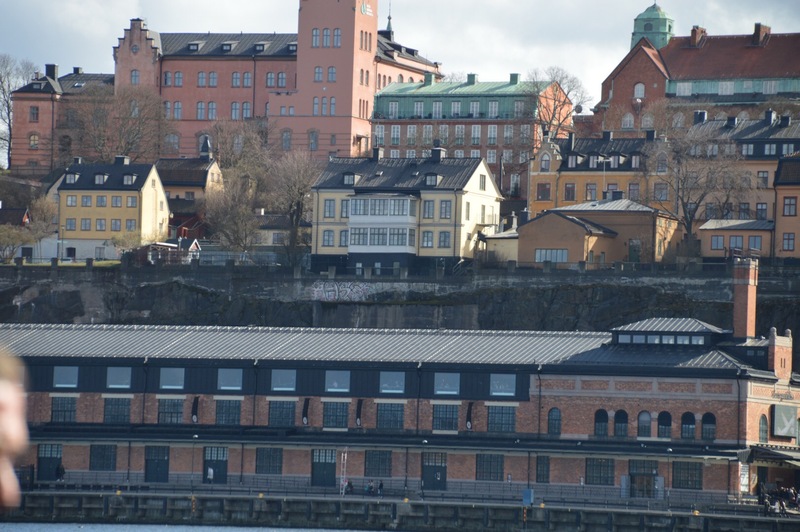 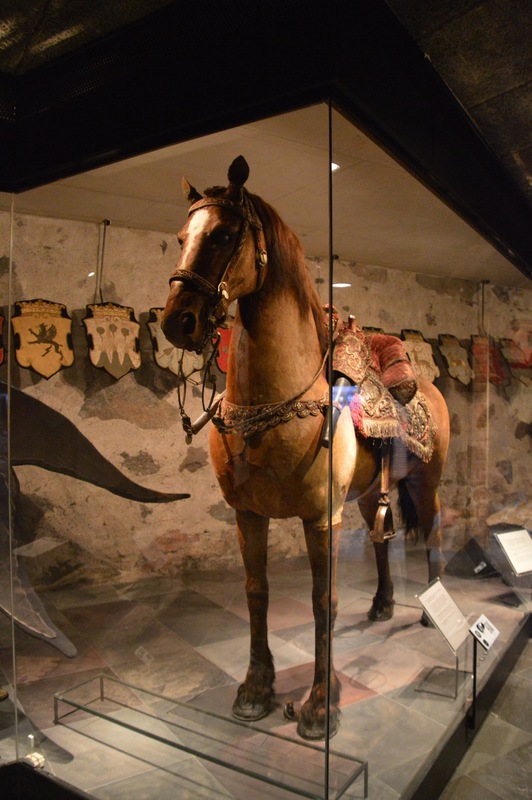 On my second day in Stockholm, I decided to check out some of the free museums in the Gamlastad or the Old Town. 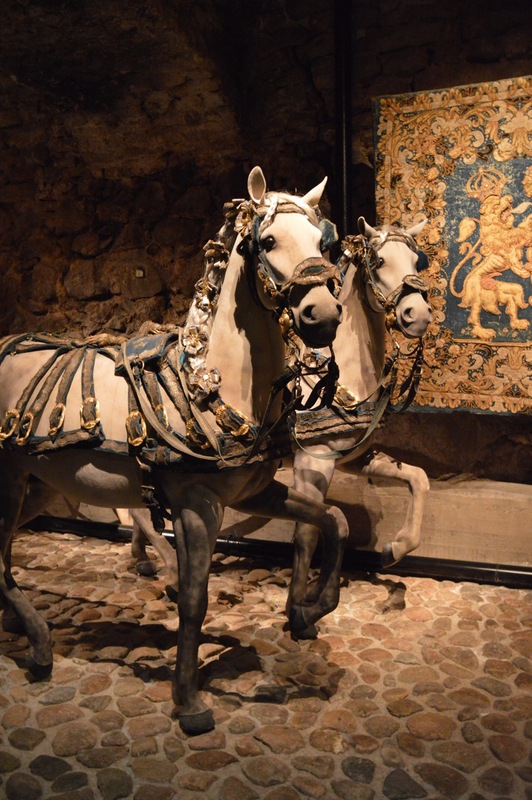 On my way to the Medieval Museum, I was distracted by a boutique gift shop, which had some beautiful souvenirs. 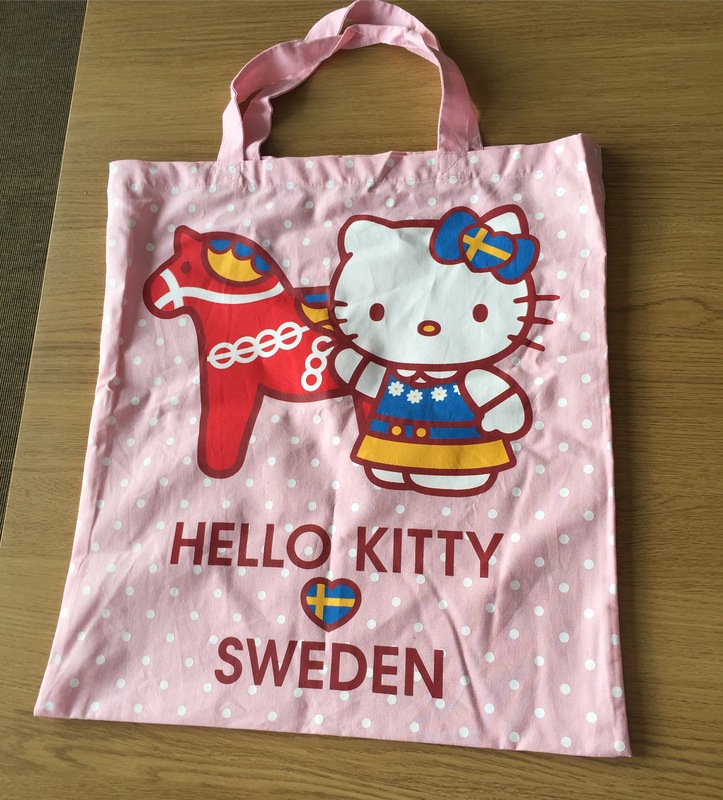 I was particularly delighted to find some which featured Hello Kitty. 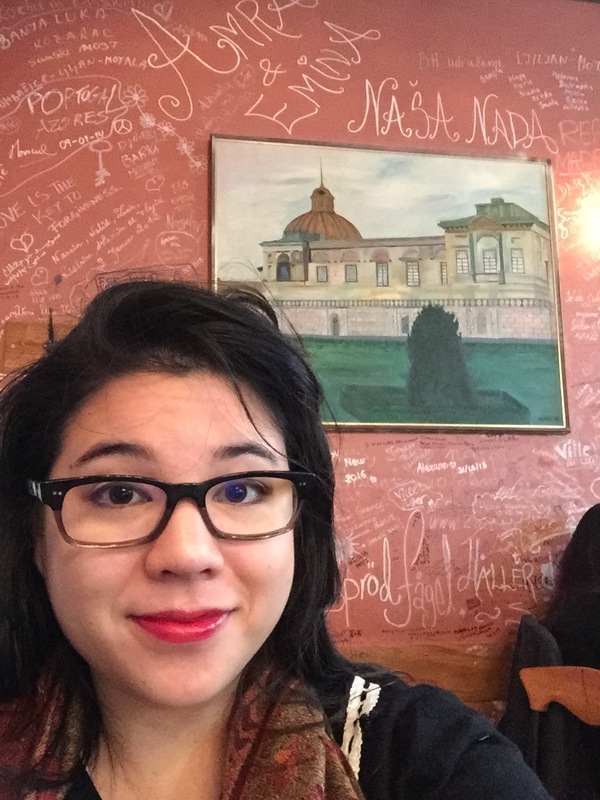 Needing sustenance after shopping, I stopped in a cafe claiming to be Stockholm’s “cutest”. 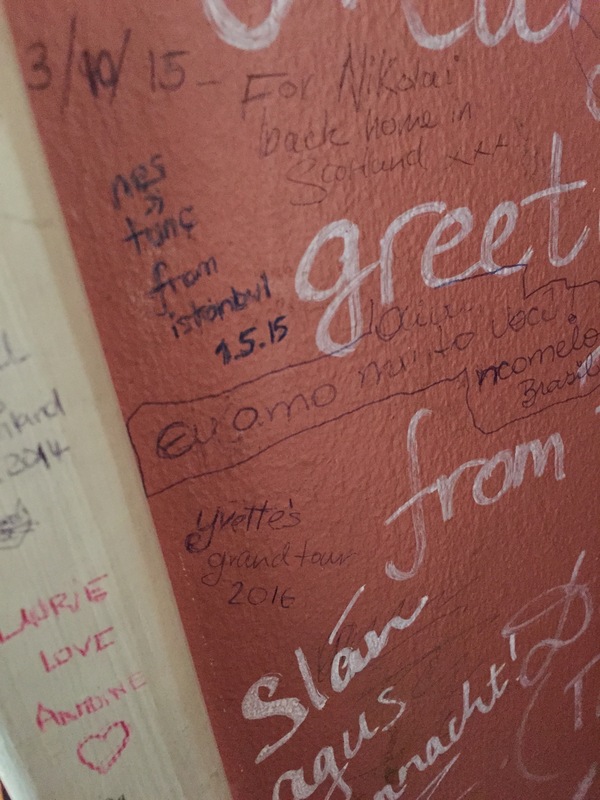 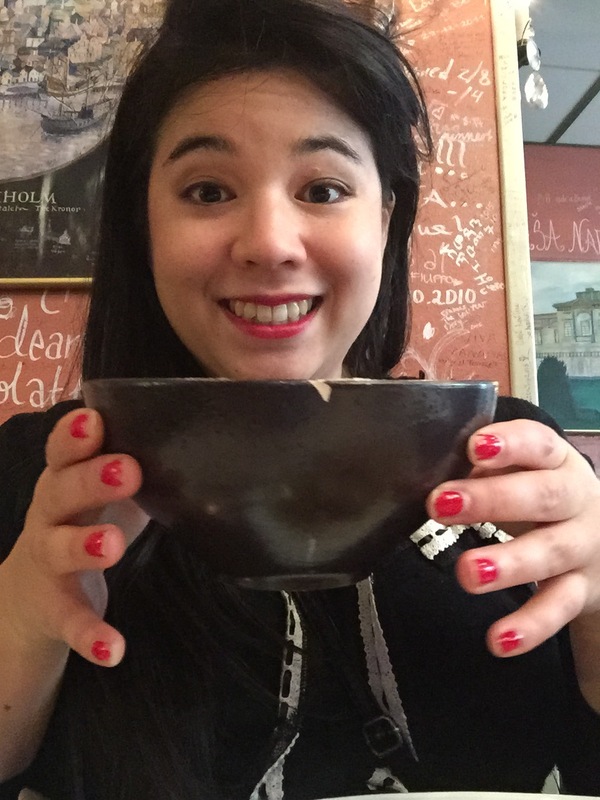 I had a massive lunch of moussaka with a bowl of chai latte and, as previous diners before me had done, I left my mark on the autographed walls. 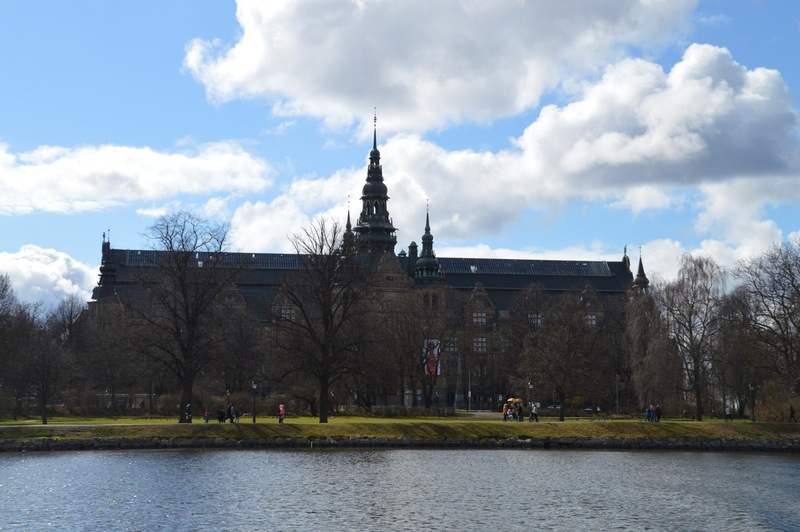 I wandered around the old town, passing important and impressive buildings at every turn! 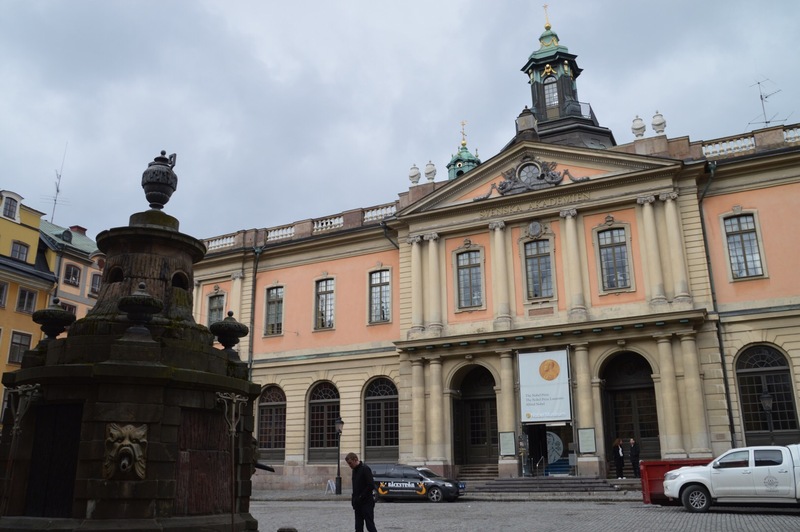 While I attempted once again to make it to the Medieval Museum, it started to pour, so I ducked into the nearest doorway, which just happened to be the Palace Armoury Museum. 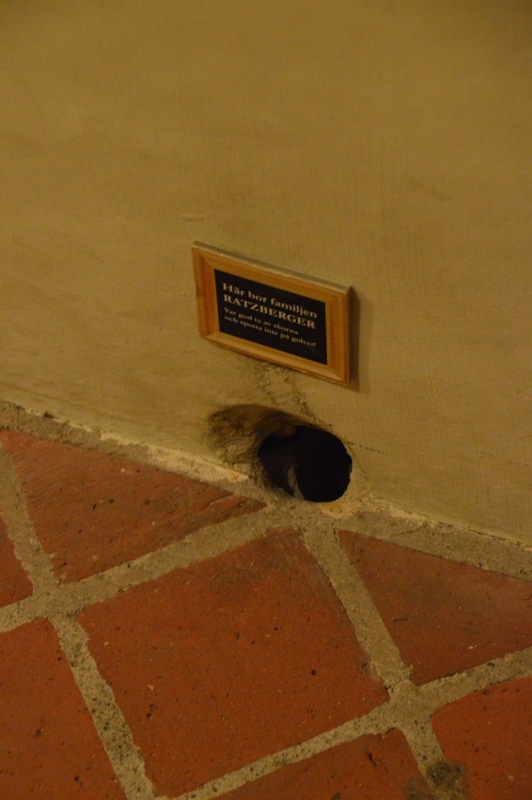 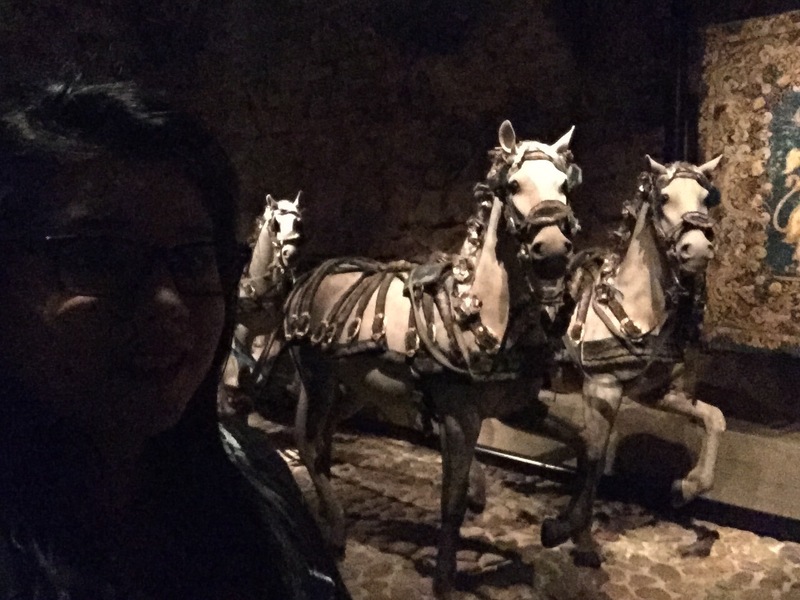 And it had free admission! 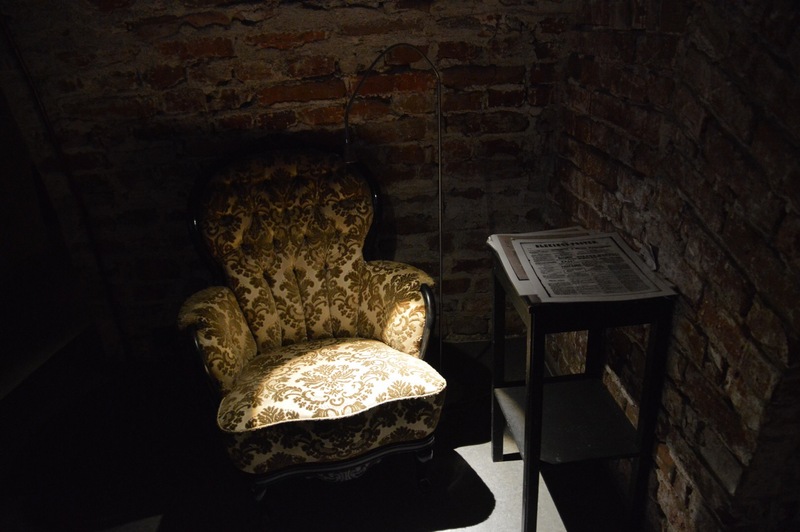 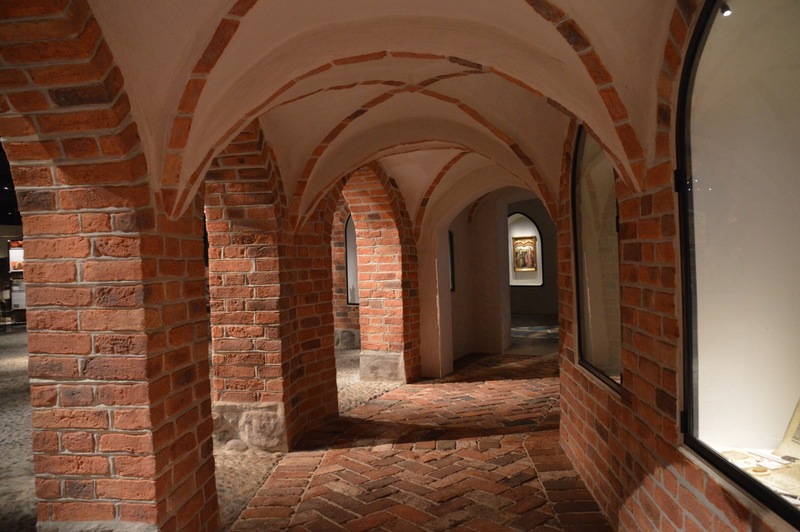 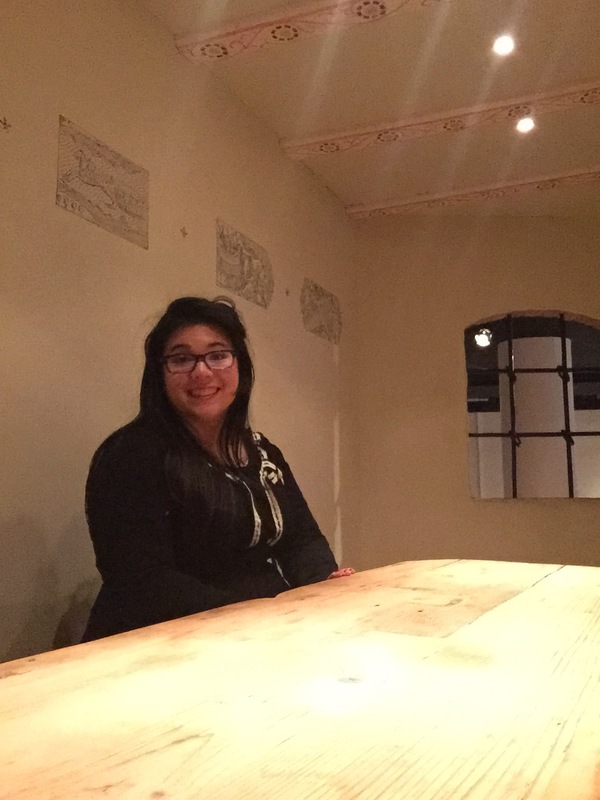 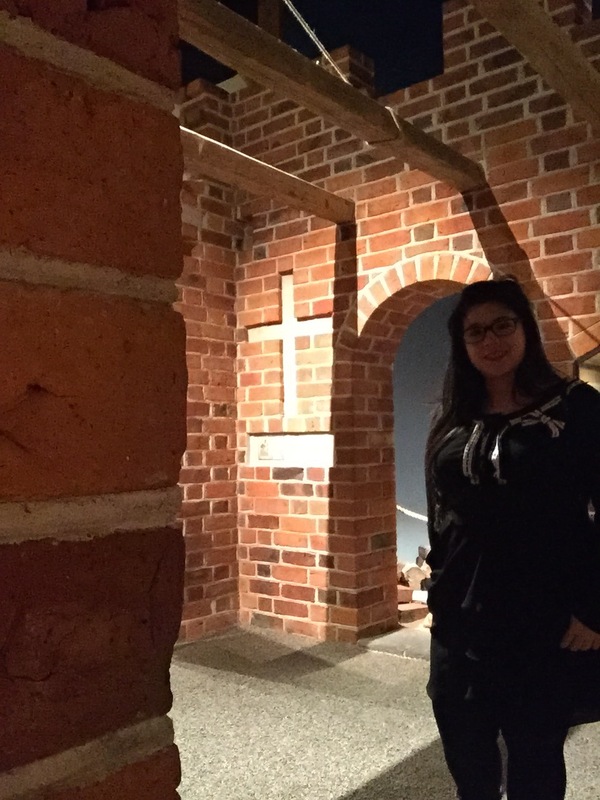 The rooms were dimly lit with exposed brick archways and a mysterious atmosphere. 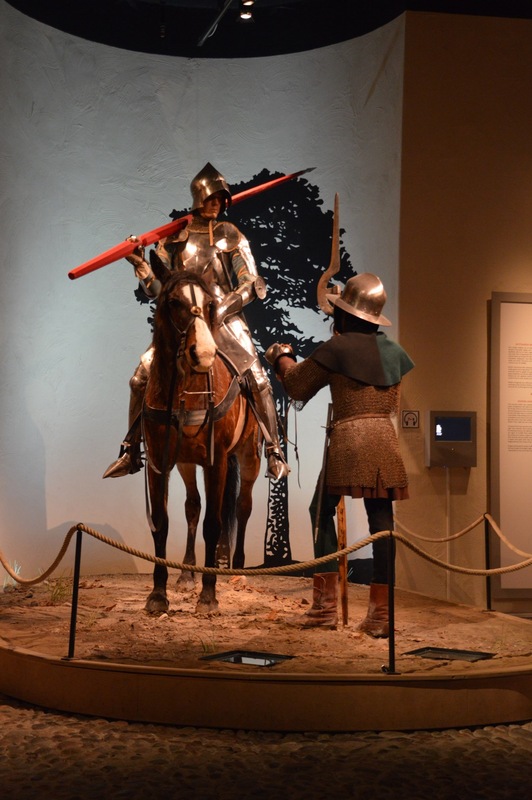 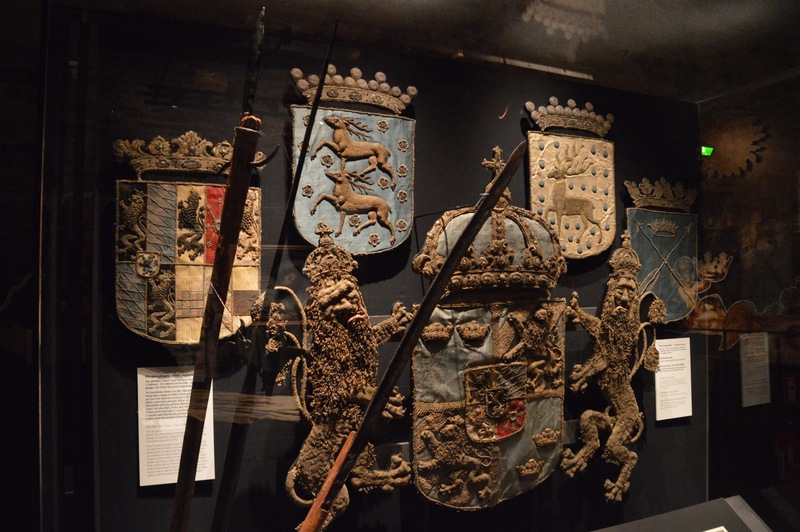 The Armoury had an exhibition focussing on the deaths and funerals of their monarchs. 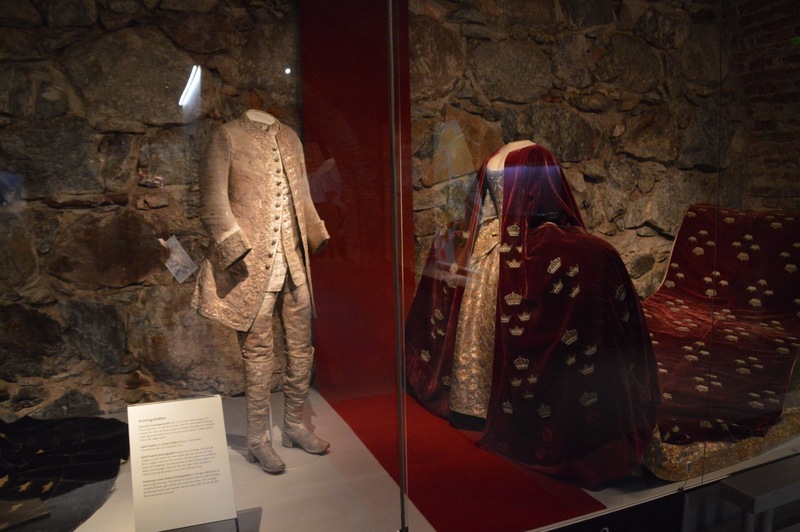 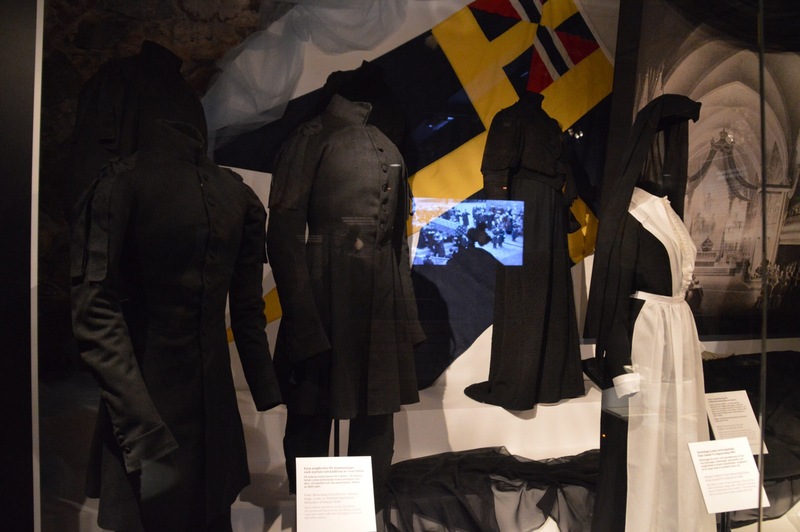 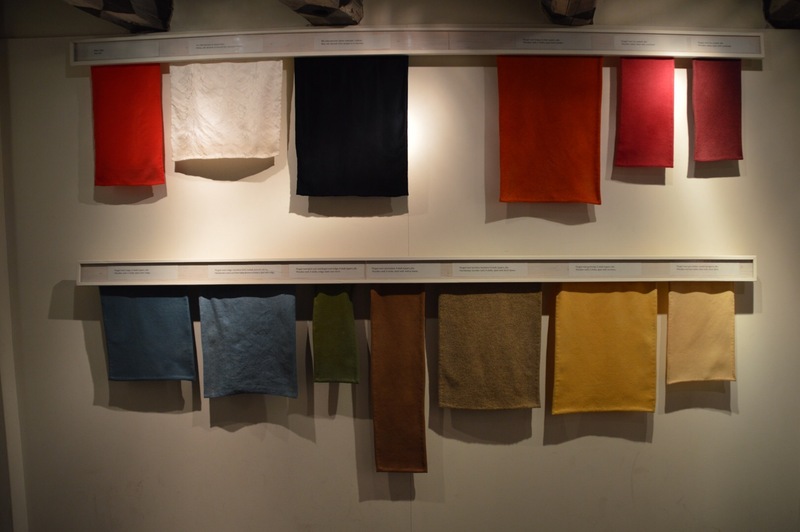 It was fascinating to see all of the costumes and artefacts used over the centuries. 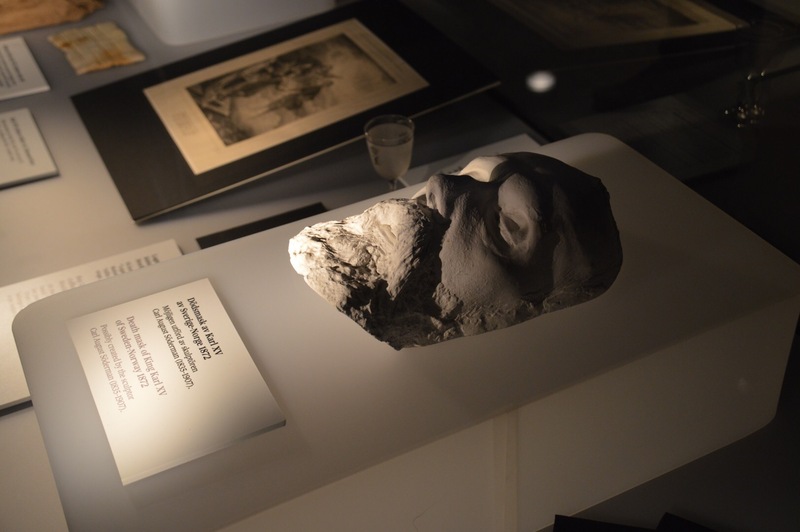 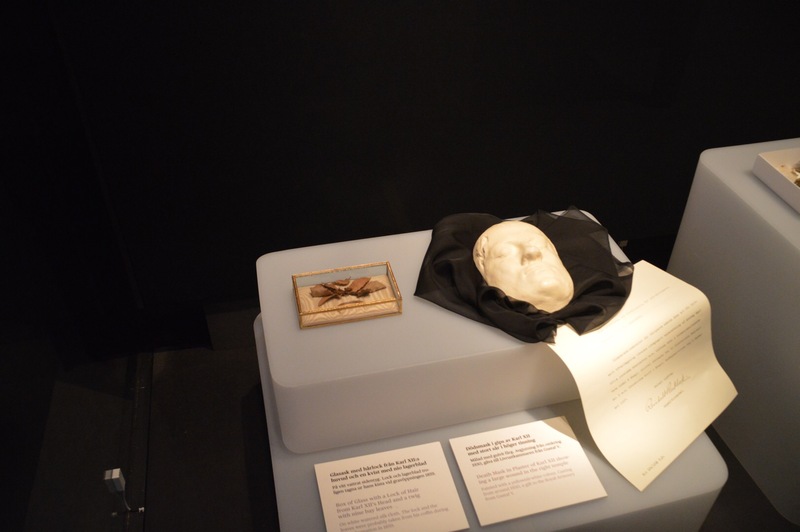 I have always been really intrigued by the idea of death masks and this exhibition delivered not one but two for my macabre enjoyment. 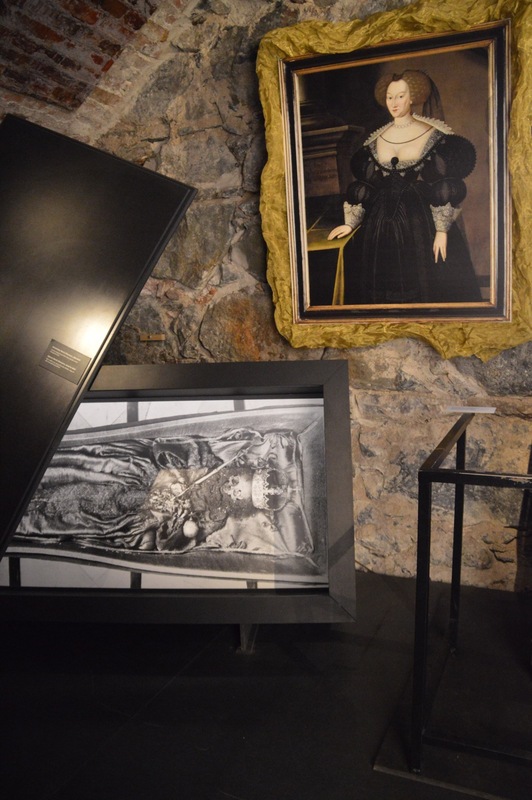 This exhibition was set up really well for children to understand and had cutouts of the deceased royals explaining who they were. 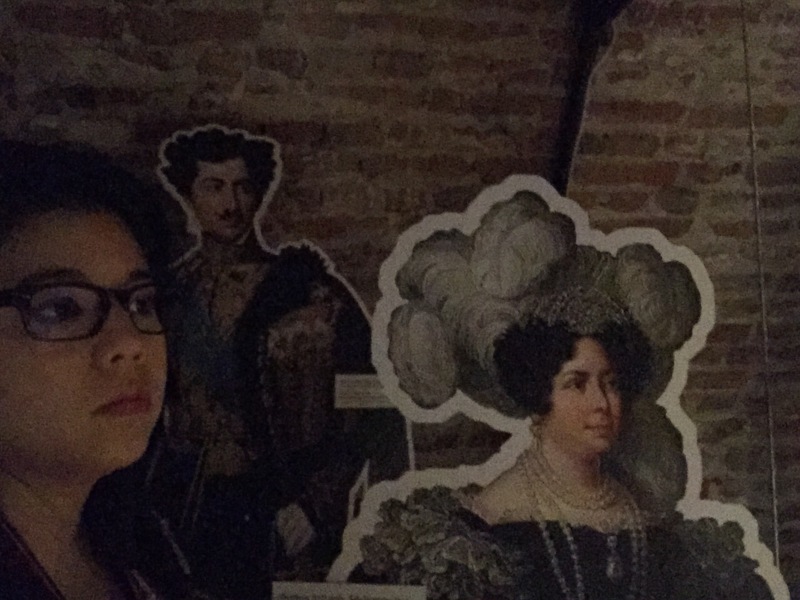 I made sure I got selfies with the important ones. 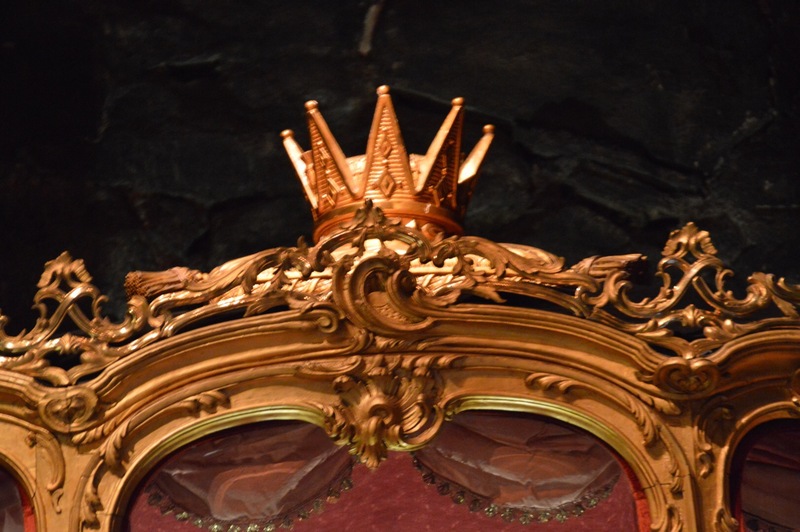 At the end, there was a large play room for dressing up as princes and princesses, but they were all children’s sizes. 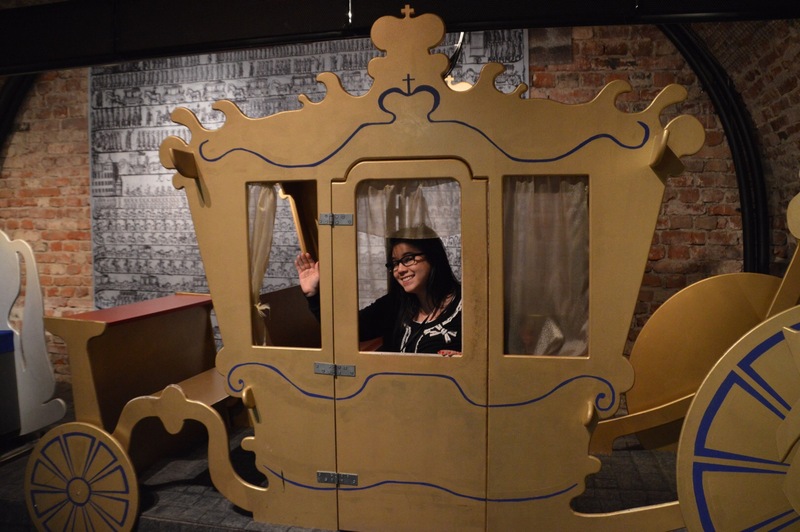 Luckily, the royal carriage was one size fits all! 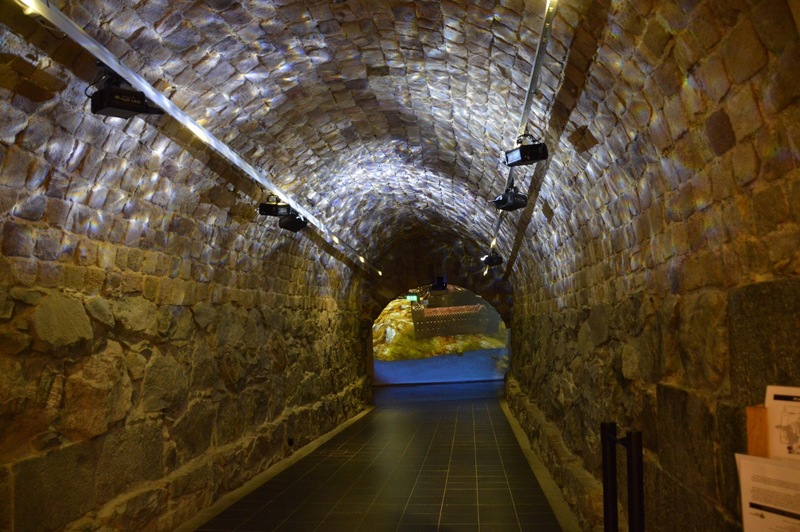 In the lower levels were armour, weapons and vehicles. 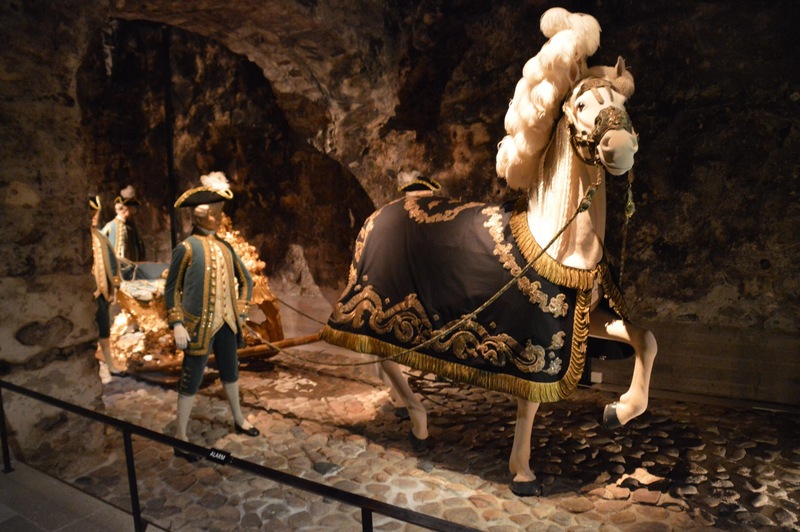 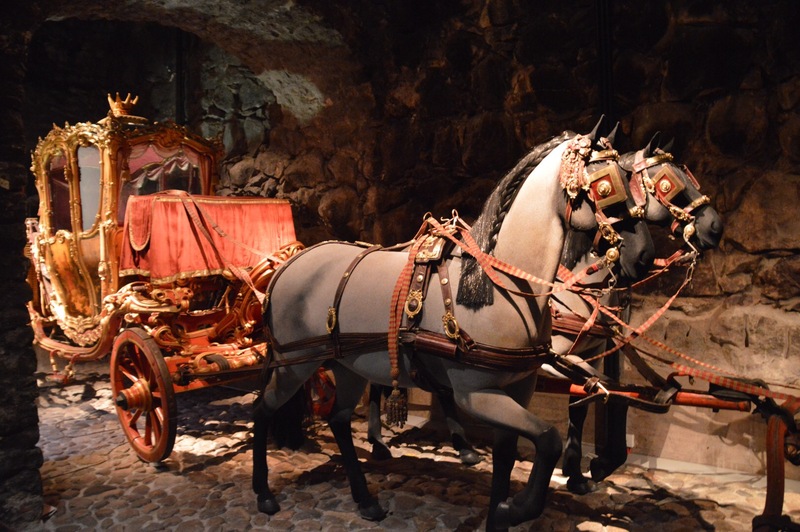 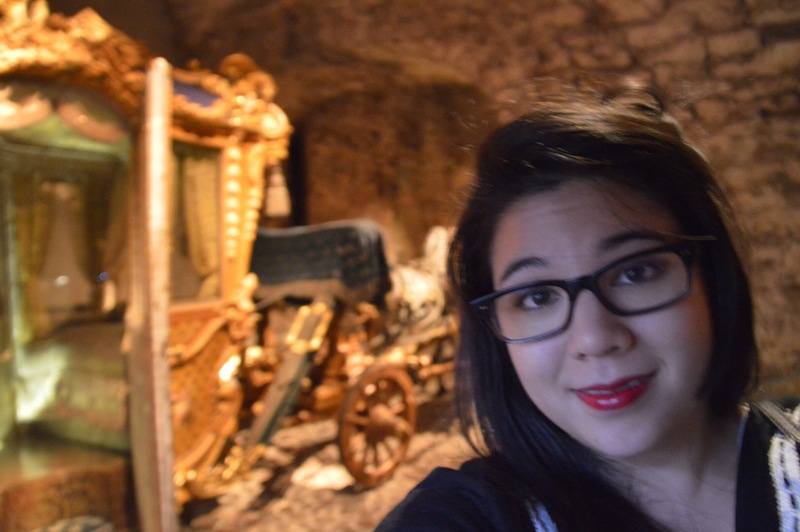 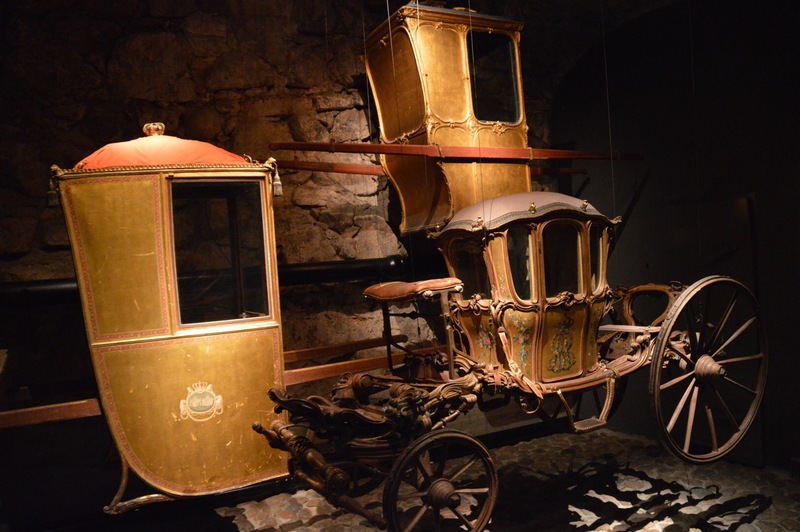 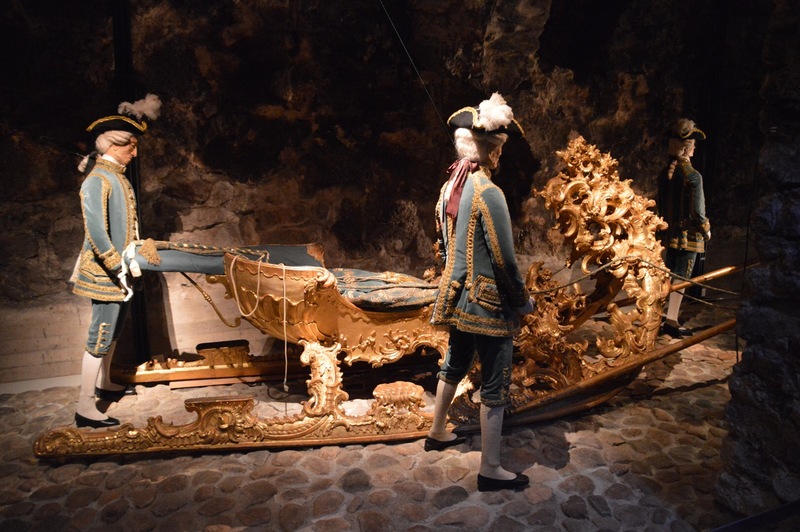 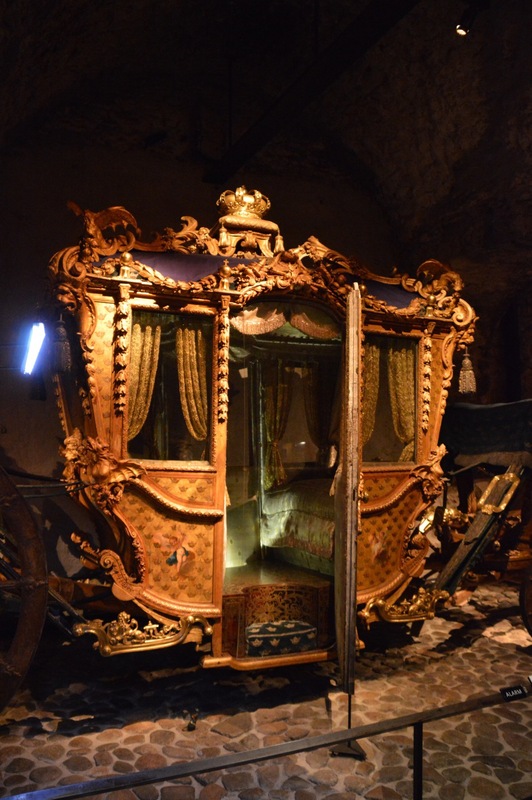 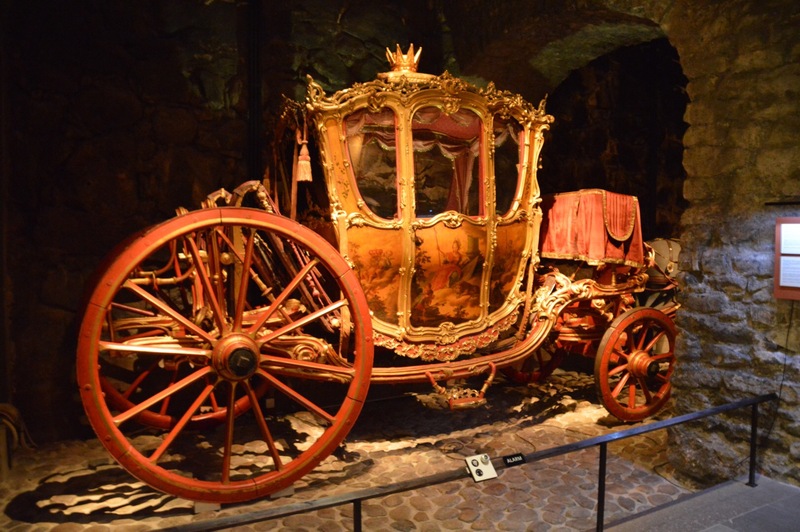 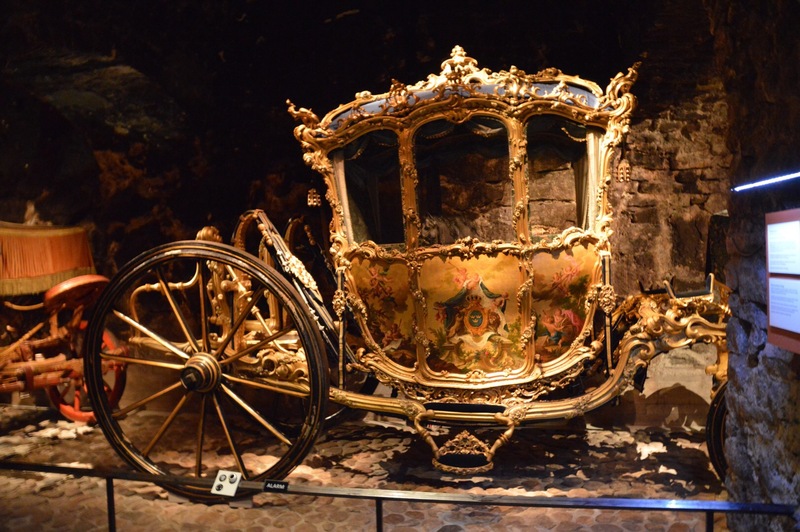 There were gilt carriages pulled by really glamorous mannequin horses and even a royal sled for the winter months! 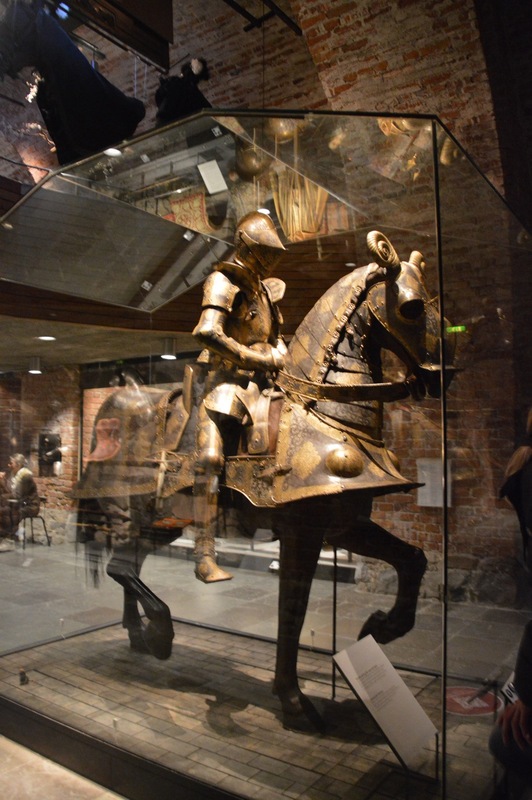 As I left the depths of the Armoury, I was surprisingly blinded by the sunlight. 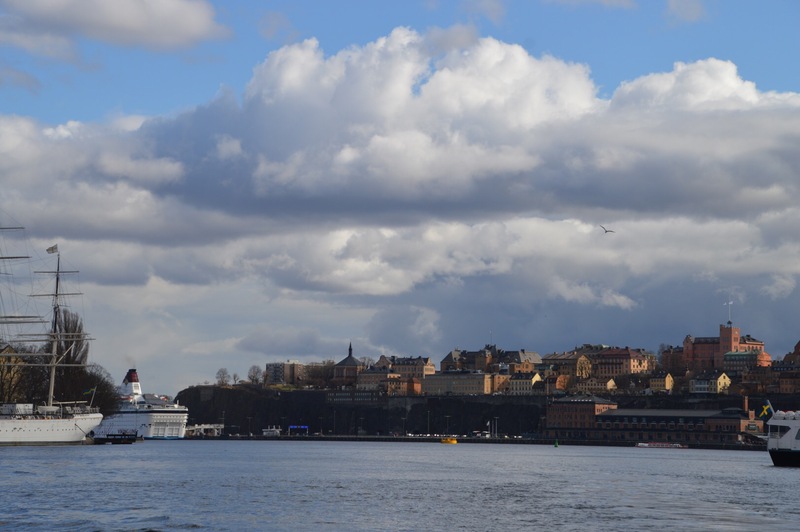 The rain clouds had been replaced by a brilliant blue sky. 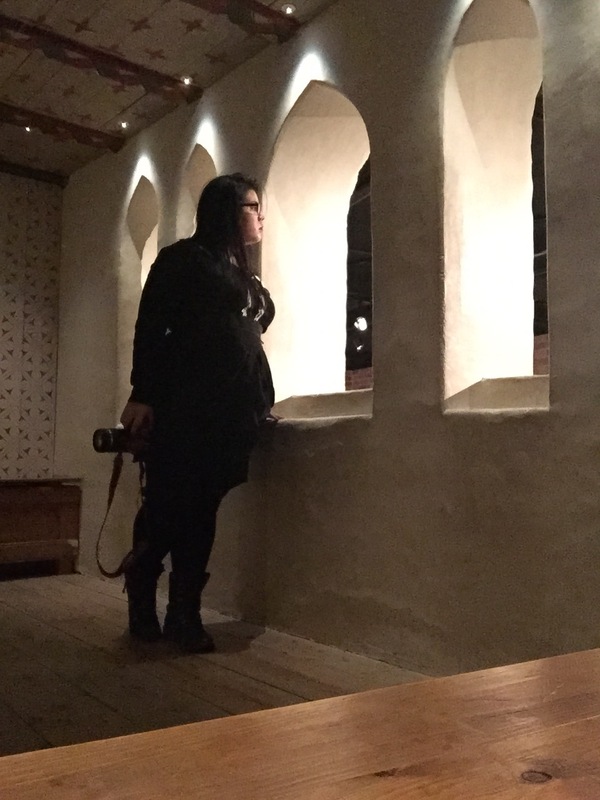 I took the opportunity to take some photos of the fleeting marvel, then headed to my original intended destination, the Medieval Museum. 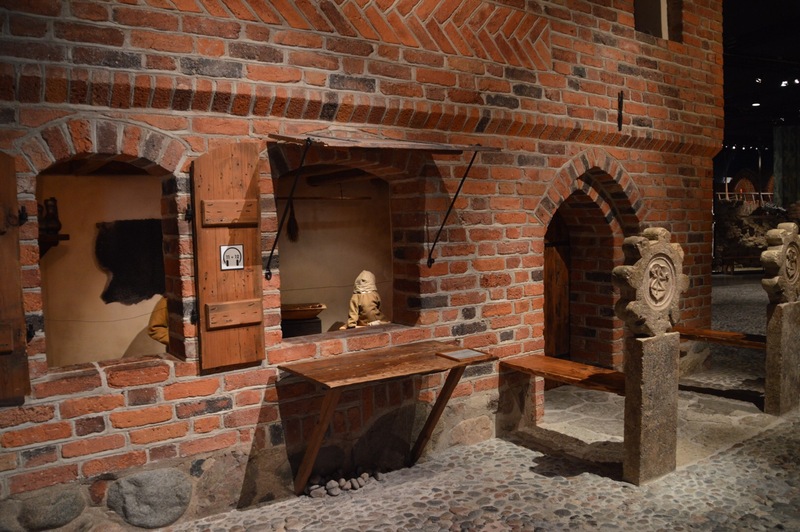 The museum houses fragments of medieval walls, complete with a skeleton! 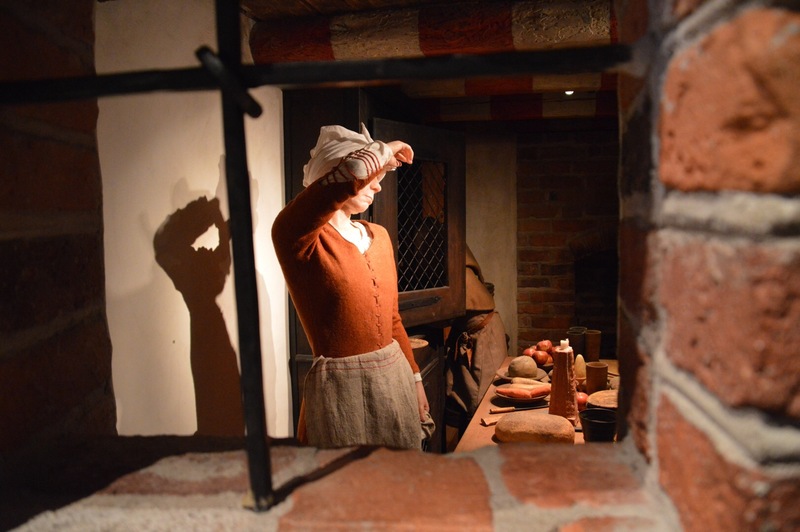 There was also a recreated indoor village where one could stroll around. 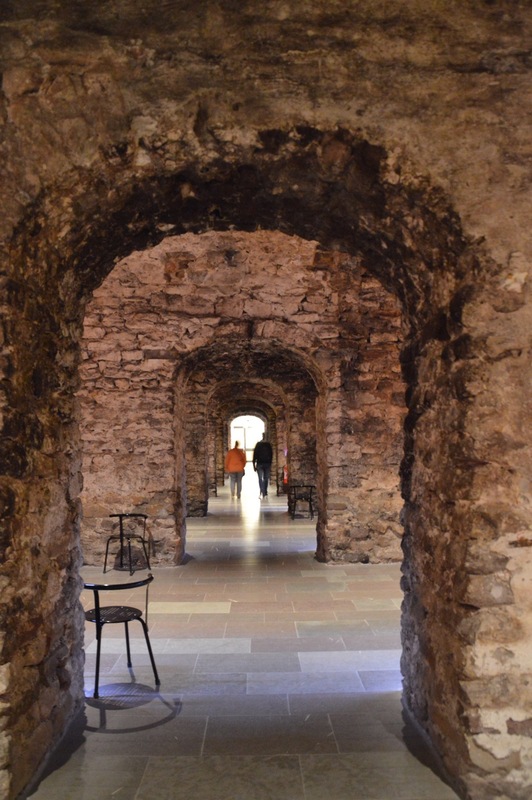 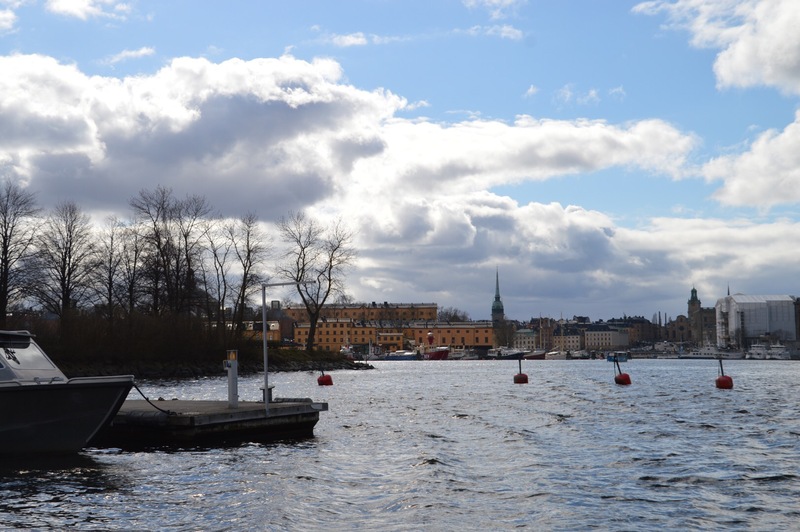 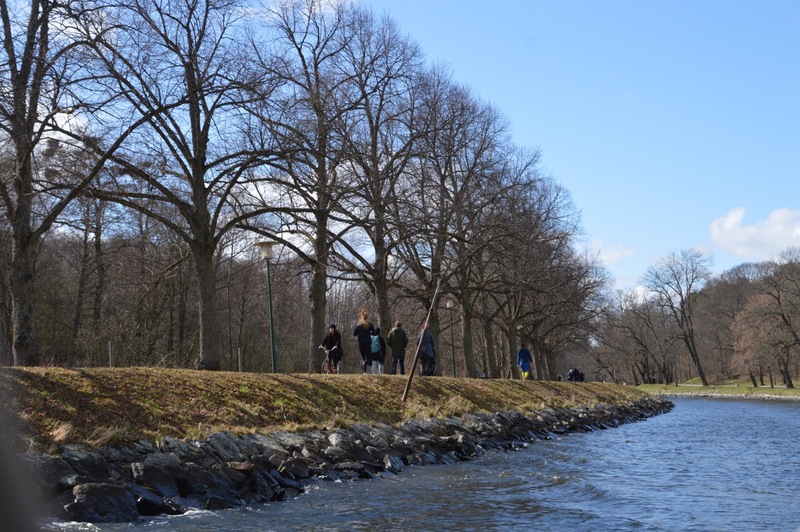 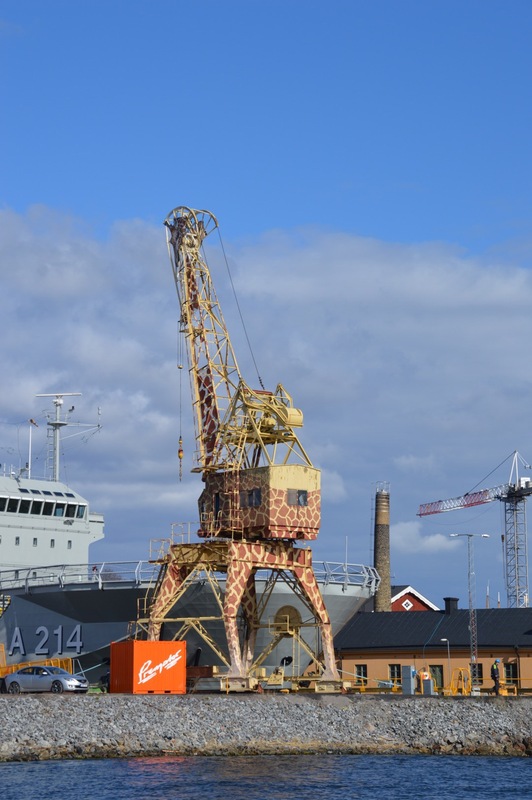 The space was almost deserted, with only a handful of other present day tourists, so it did have the feel of exploring the Stockholm of the past. 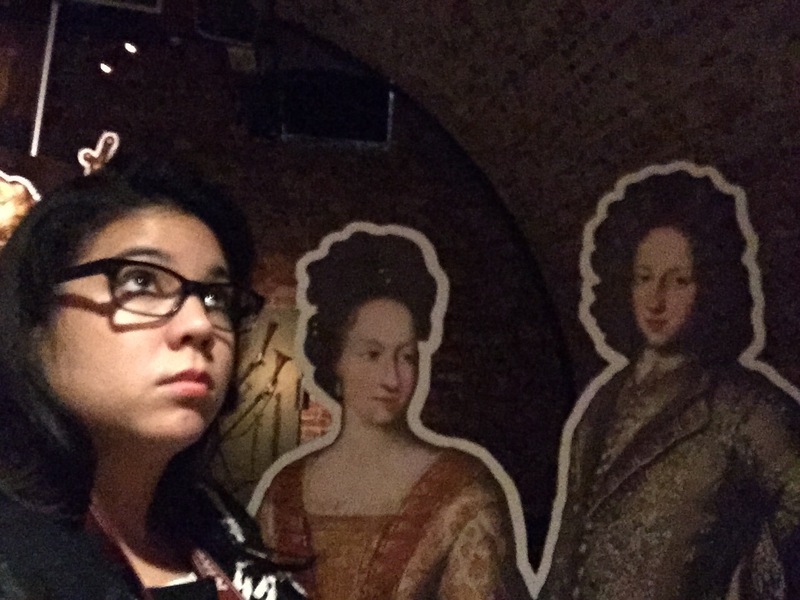 In the evening, I was reunited with Taz and Toby, and we celebrated the weekend with kebab-topped pizzas! 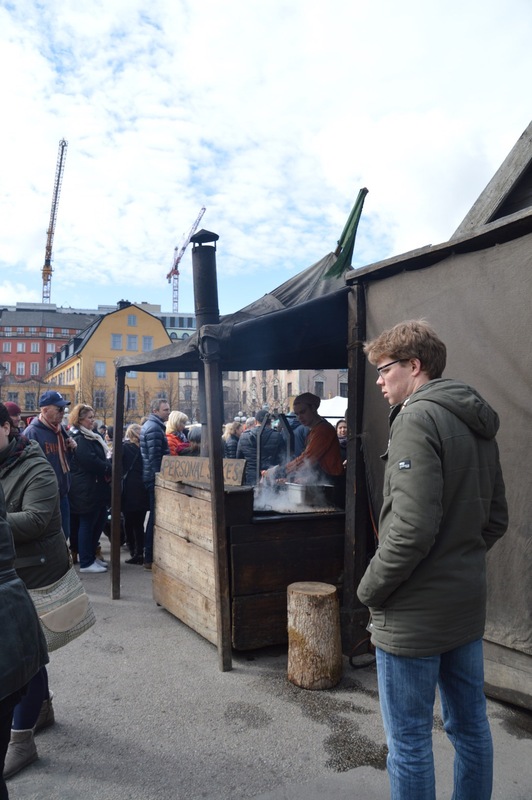 The next day, we and I returned to the city and were treated to more medieval Stockholm, this time in the form of a fair in King’s Garden! 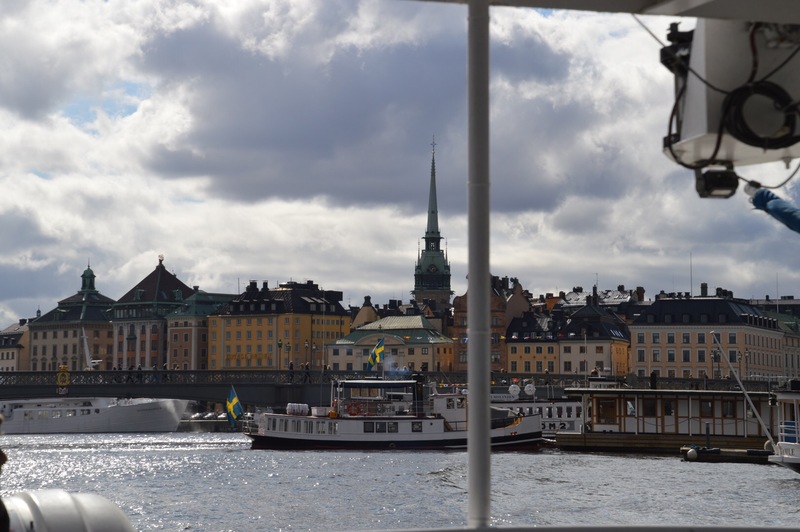 I had my heart set on a boat ride around the canals so we booked a tour of the royal canals, sitting outside for maximum photo opportunities. 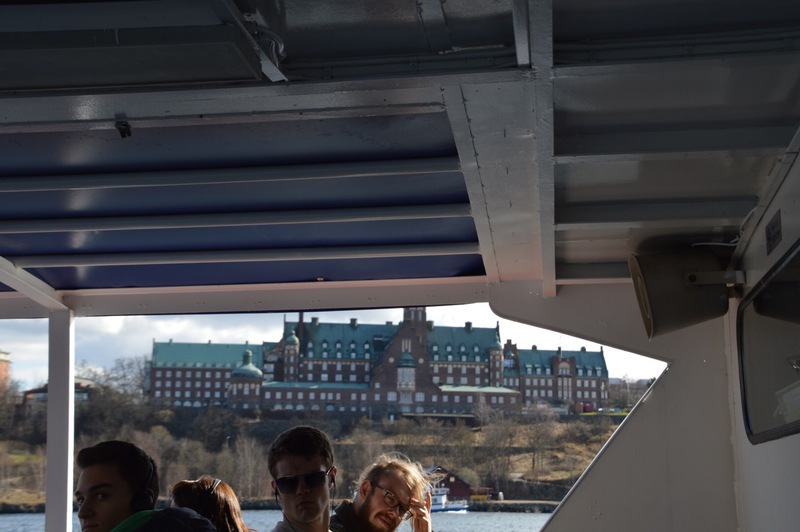 The onboard commentary was informative and entertaining, pointing out landmarks such as the retirement home that was mistaken by a foreign navy as the royal palace and detailing the scandal surrounding the marriage of the crown princess to her personal trainer. 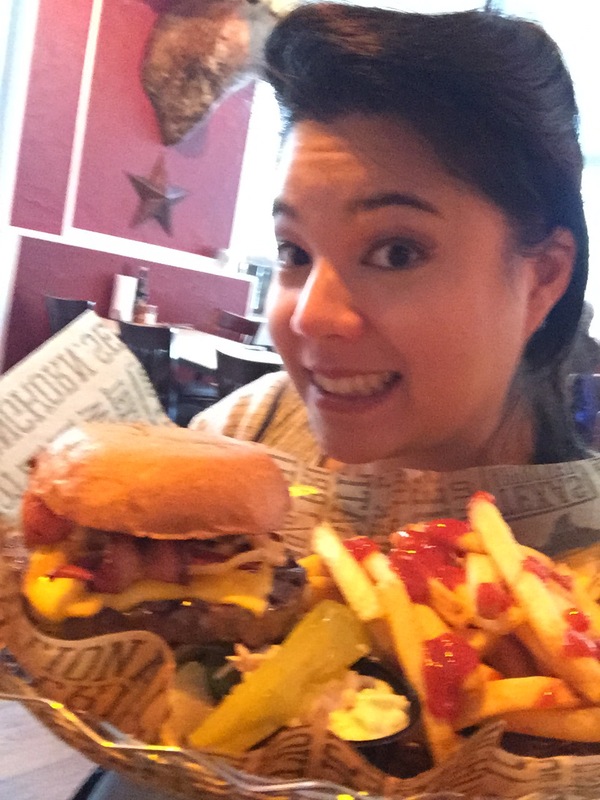 The rest of the day was spent eating burgers and shopping for gloves in the city whilst Marcus watched hockey in a pub. 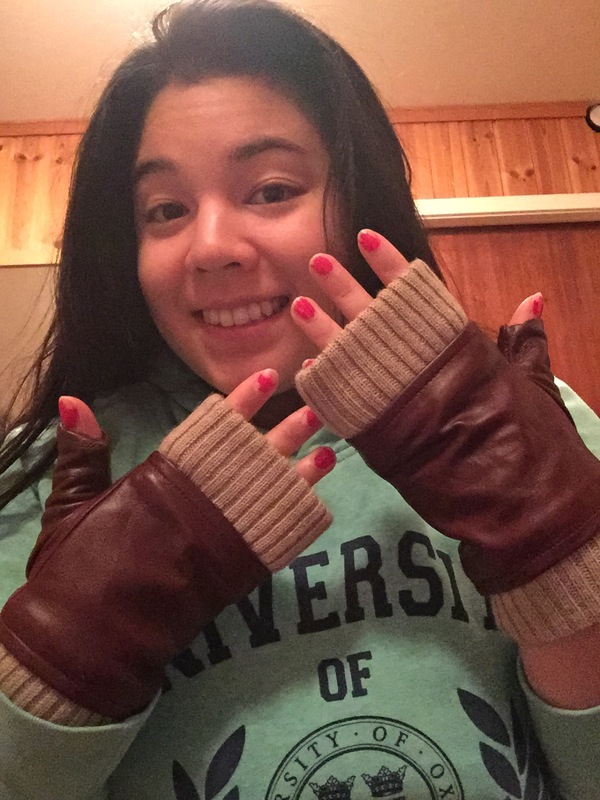 A win for everyone! 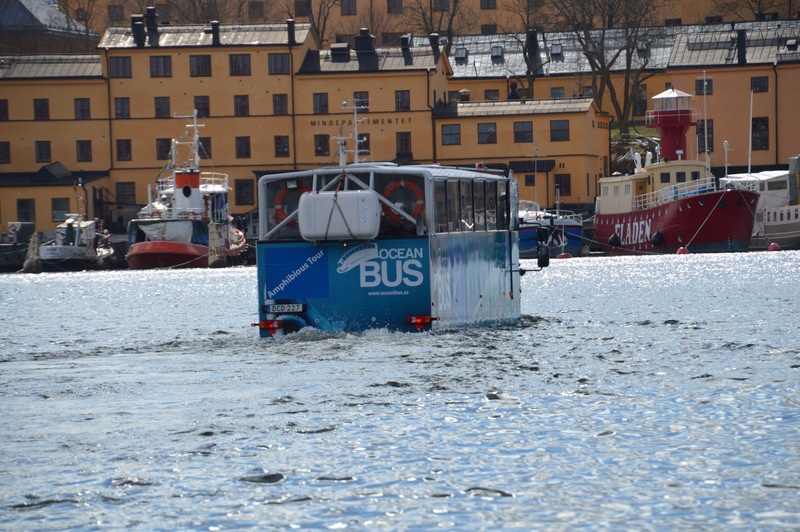 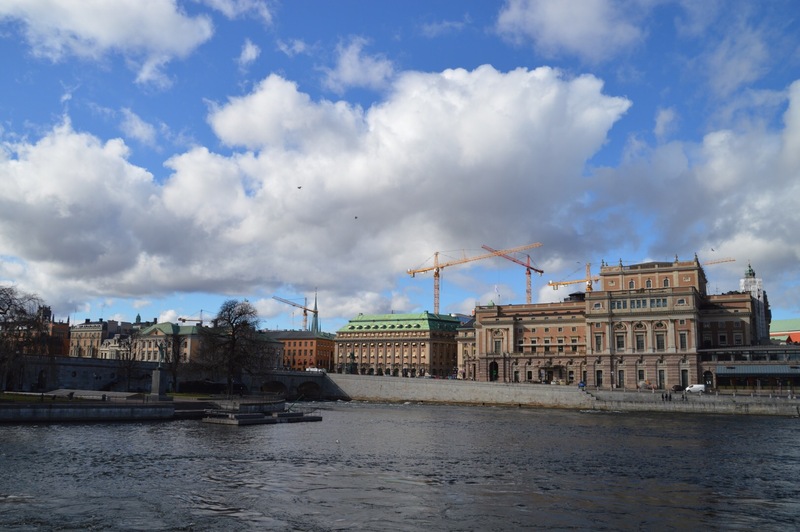 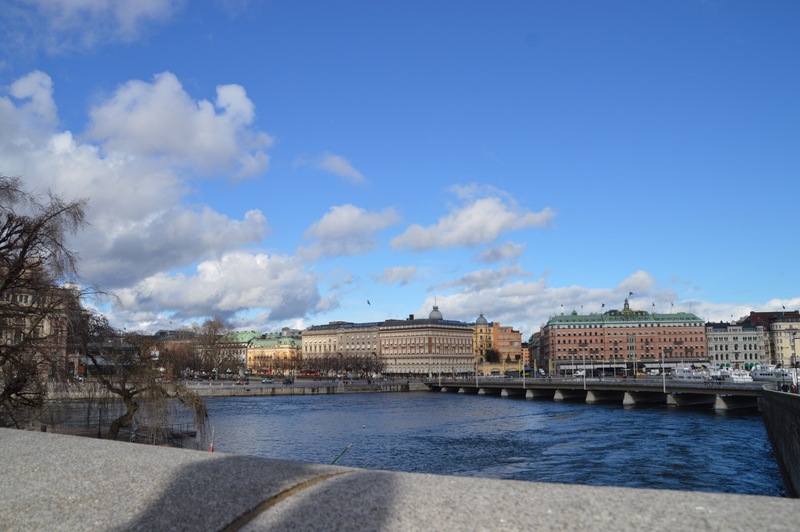 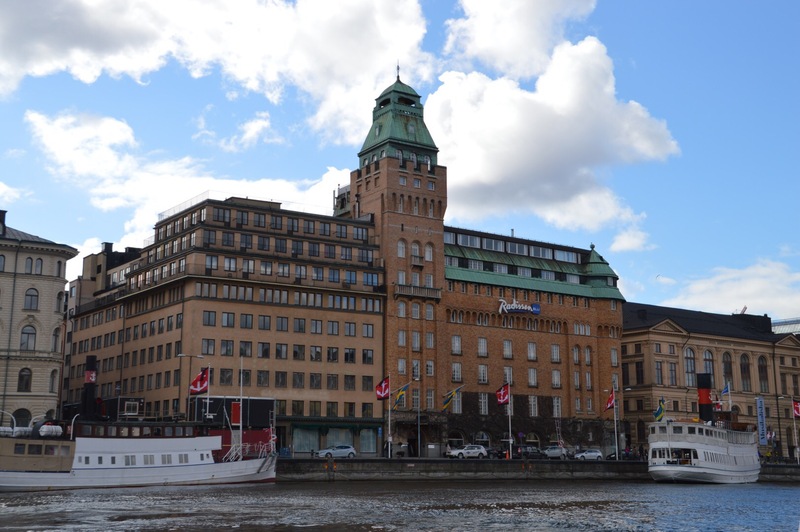 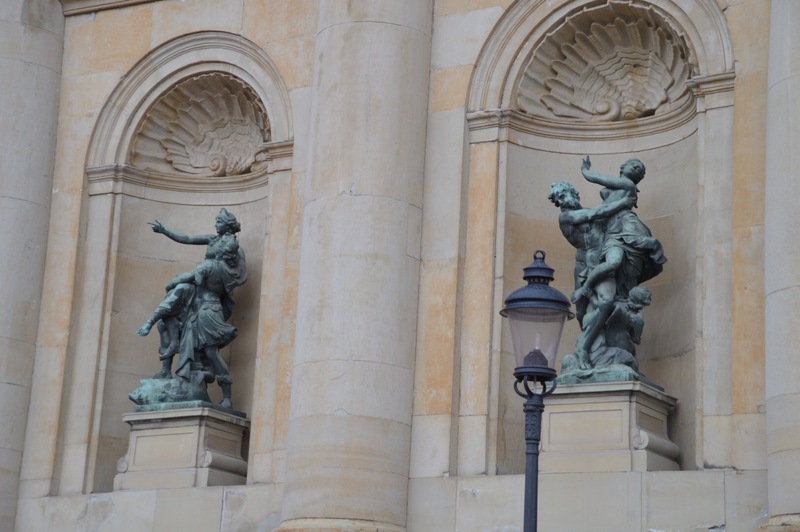 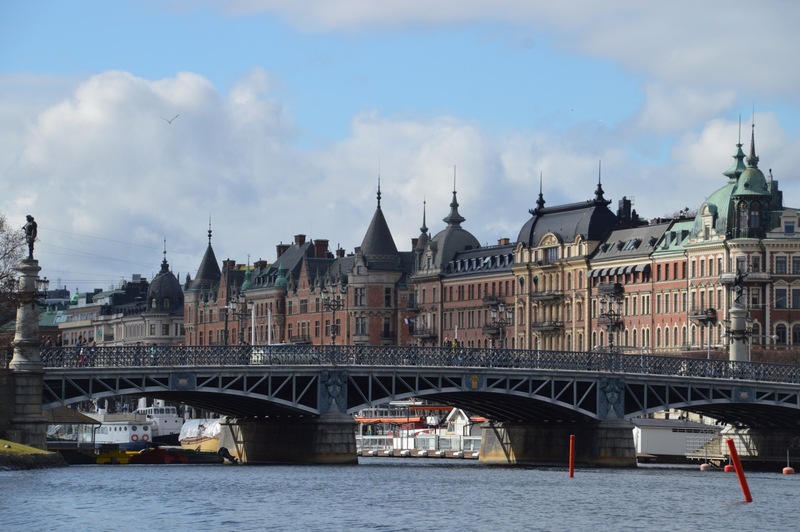 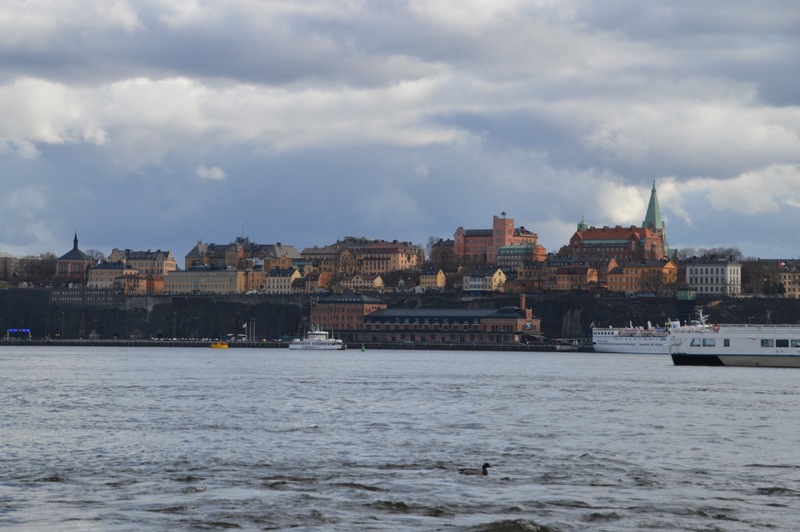 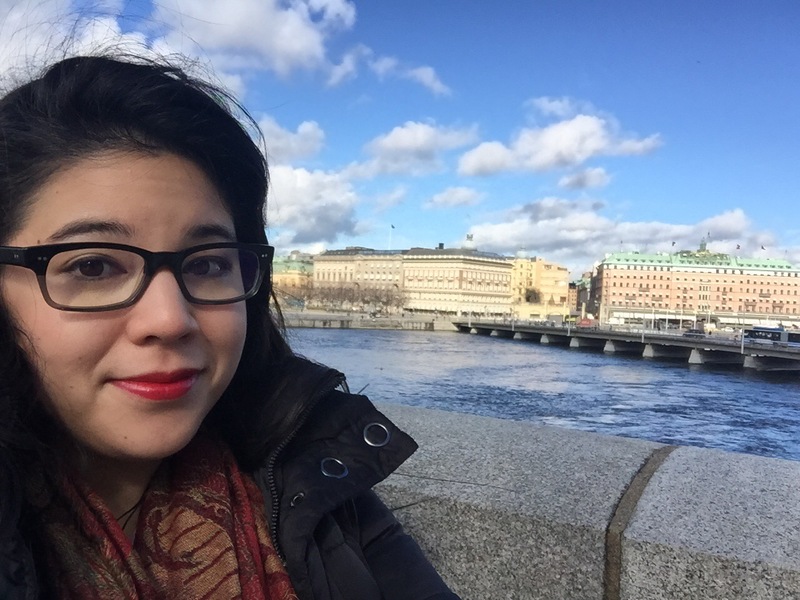 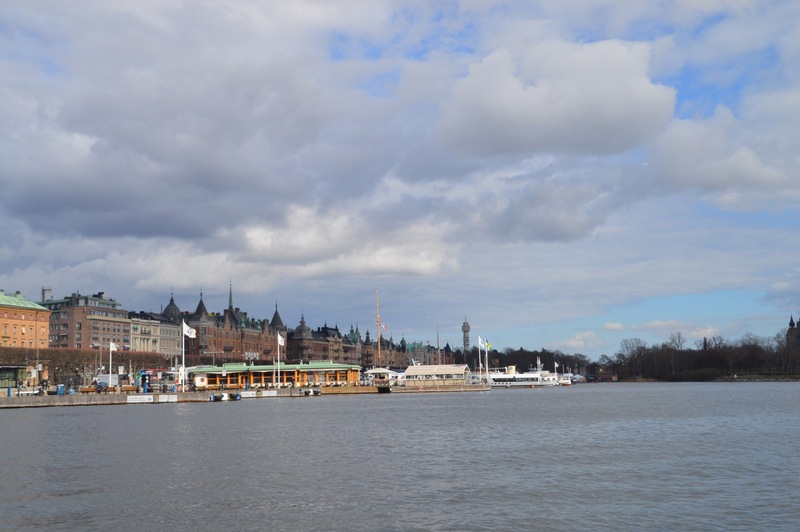 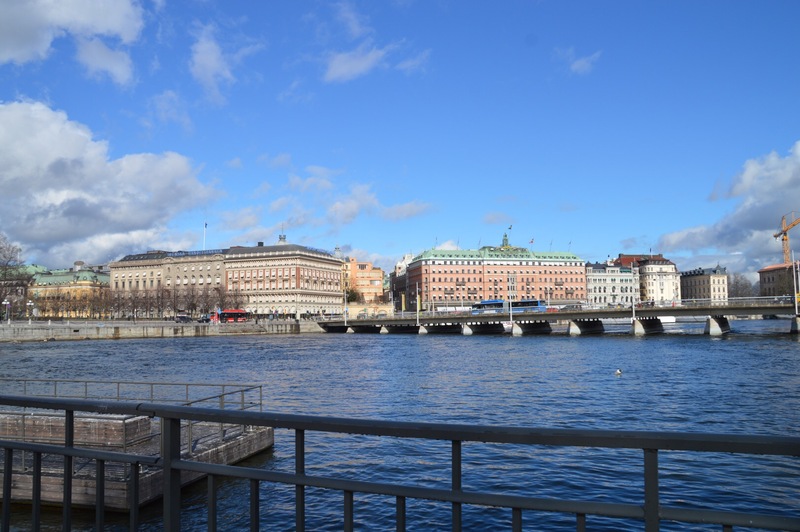 After your many museum visits, you will be somewhat of an expert on aspects of Stockholm’s history. 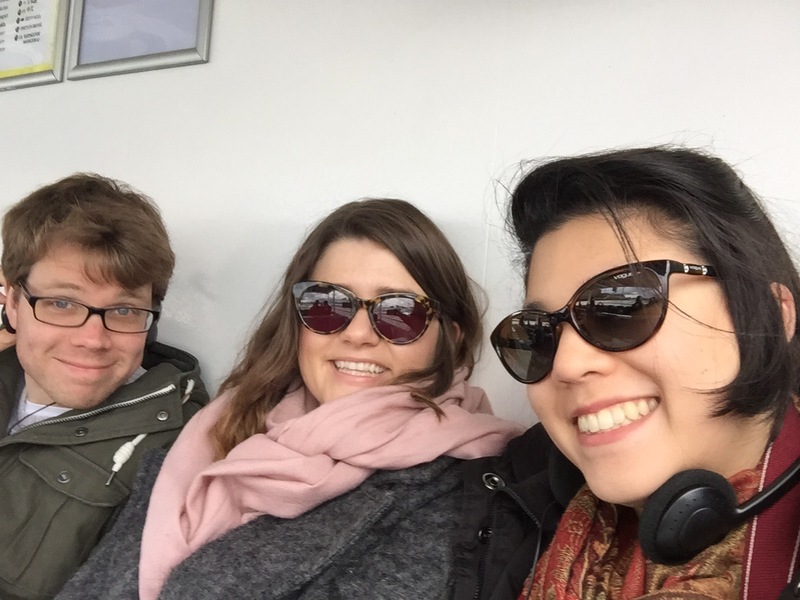 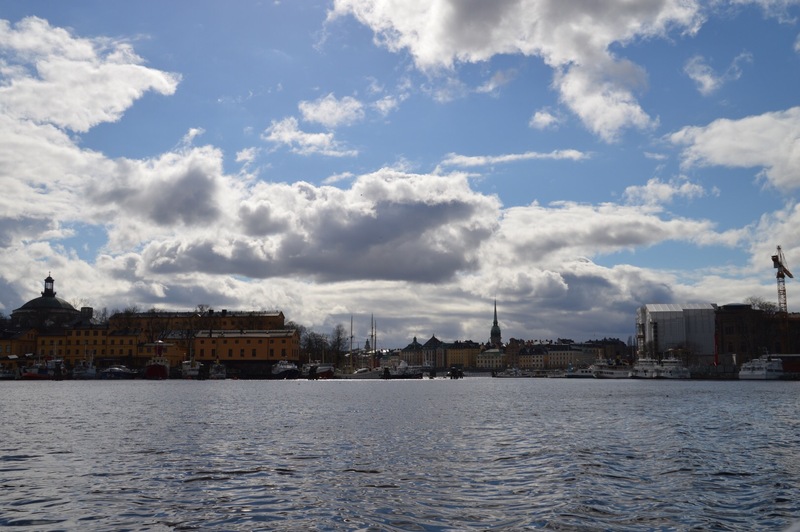 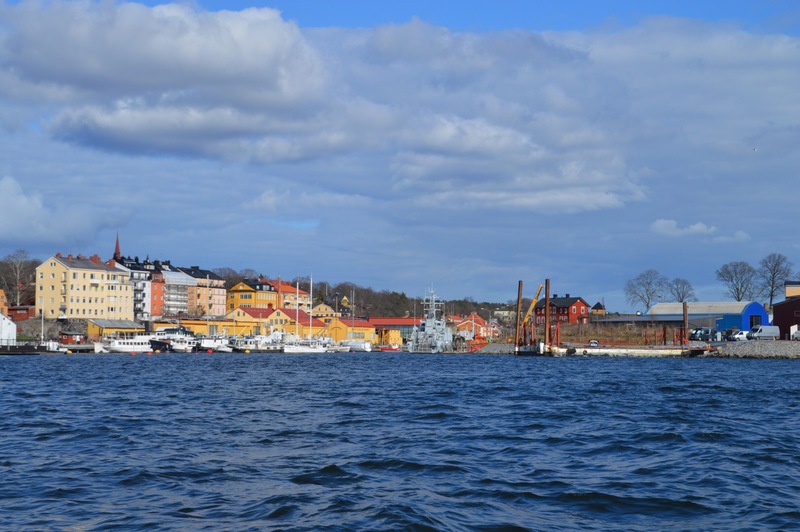 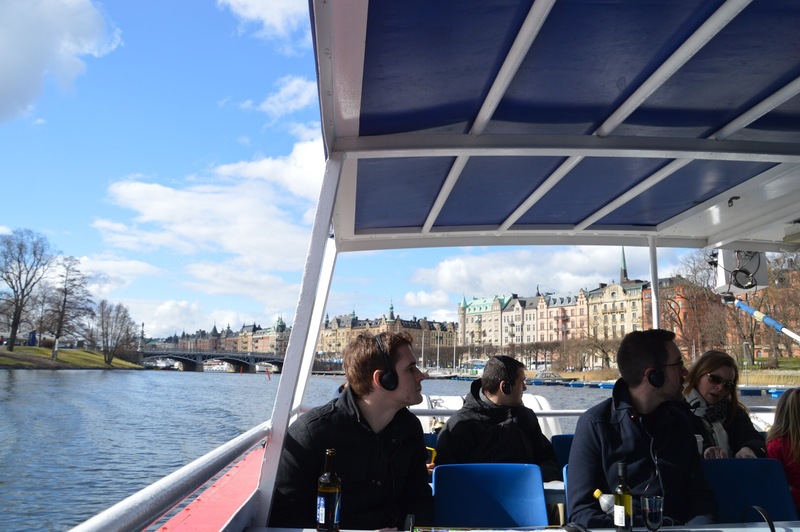 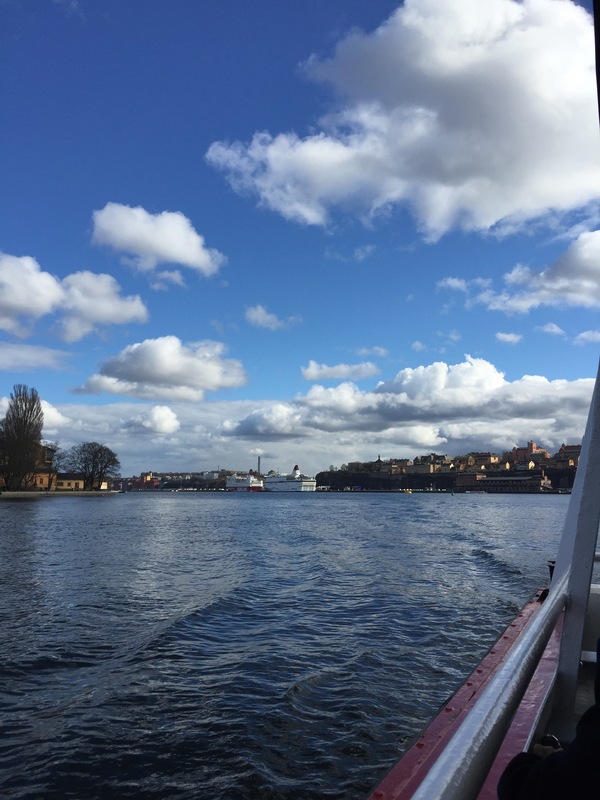 The photos taken on the boat trip are great – what beautiful weather!